With the ScanGaugeD, you can monitor the most vital systems of your large diesel powered vehicle and provide the kind of real time information youve been missing. Features include more than 15 built-in digital gauges, 5 Trip Computers and an easy-to-use ScanTool that shows trouble codes all in a compact design that installs in minutes. Includes: ScanGaugeD display, 6 ft connection cable with both 6 & 9-pin DTC connectors, 2 Velcro mounting strips, Pictorial User Manual and Quick Start Guide. The US government has put out a report that says driving habits can change fuel-economyy up to 33%. ScanGaugeII provides real-time data about your vehicle’s instant and average fuel economy, fuel used, cost of fuel used for each trip, cost per mile, gallons per hour and more! Turn off That Check Engine Light! The ScanGaugeII can check for Diagnostic Trouble Codes (DTCs) and if found, can display how many there are and the Trouble Codes themselves. Using the internet or repair manuals, these can be translated to the failed component and repairs can be made. Data captured when the Trouble Code was set can be recalled to help troubleshoot the problems (was the temperature hot or cold, speed high or low, etc.). The ScanGauge II can be used to clear the trouble codes and data which will turn off the warning lamp. Is Your Vehicle Ready for Emissions Testing? Some states now require that vehicle self tests have been completed since the codes were last cleared, before running emissions checks. The ScanGauge reports this “Readiness”. If no codes where found and your Check Engine light is still on, your vehicle may be storing pending codes. 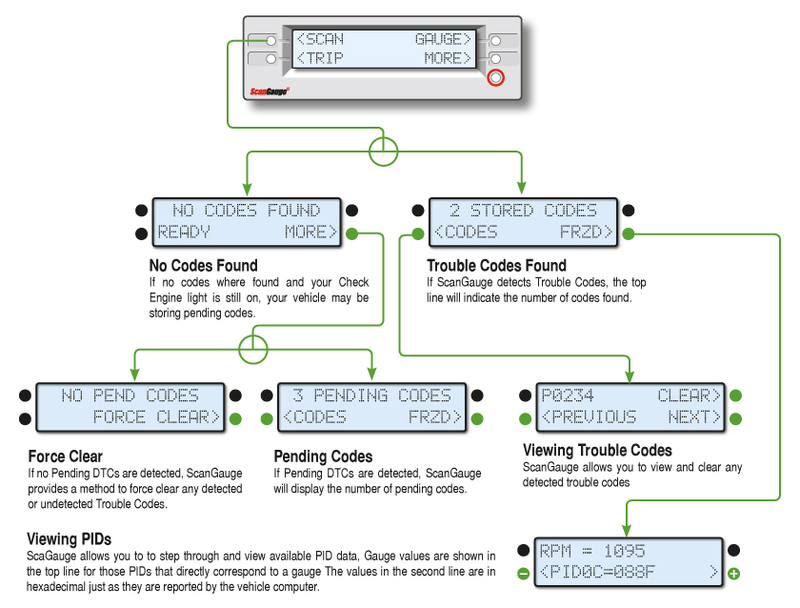 ScanGauge provides a method to force clear any detected or undetected Trouble Codes.